Effortlessly updating a traditional design, the Bradbury Oak Dining Chair Black is a modern classic that will stand the test of time. The Bradbury is a wonderful addition to the dining area and is guaranteed to amaze your guests with its dashing design. 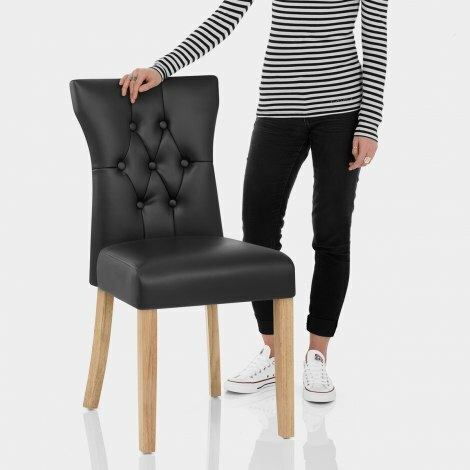 The seat is covered in beautiful black faux leather, and includes a webbed frame for a truly comfortable dining experience. 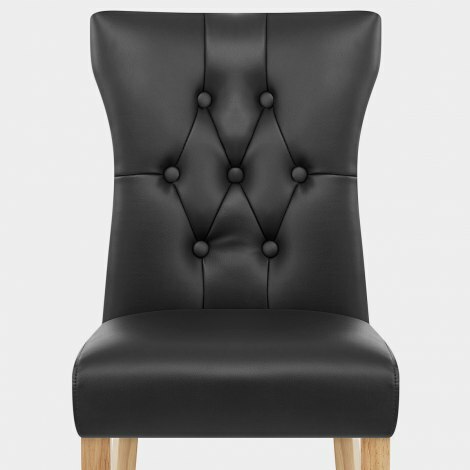 A winged backrest gives this model a distinct feature, while button and stitch detailing make for chic embellishment. Four solid wooden legs taper to the floor and come together to make a strong frame, each complete with a rustic oak finish and protective floor plugs. "Excellent delivery, brilliant quality, Looks fab"
Liked it so much we bought a second, easy order first class delivery, will recommend to our friends. Very pleased with the chair exactly what we wanted. These chairs fit perfectly in my diner kitchen love them. Excellent delivery, brilliant quality, Looks fab.